As an antidote to the current affairs occupying citizens in the US and throughout the world, I would like to muse about music in this blog, reflecting on a recent and inspiring experience. I enjoy most genres of music, but I have studied classical music since I was a child. After a hiatus of several decades, I began to study classical and jazz piano again. 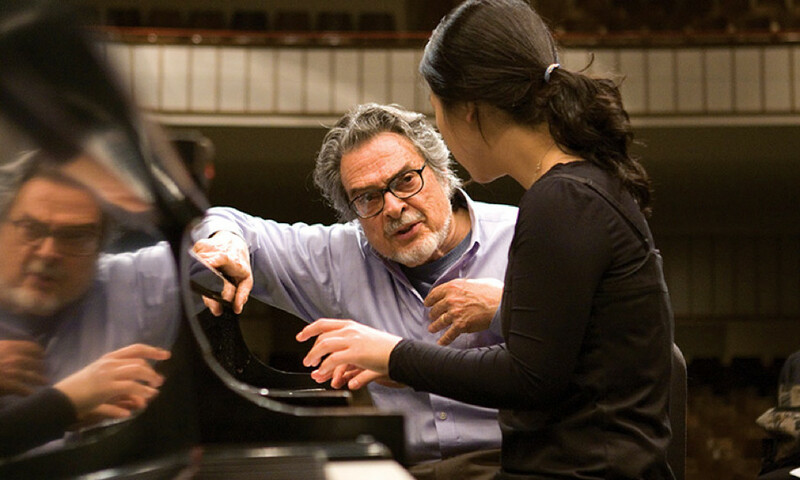 Recently, I attended a Master Class for piano conducted by the renowned Leon Fleisher, at the Peabody Conservatory in Baltimore. I’m sharing a little of what I learned from this 88-year old Master who commanded the stage with his presence, bringing to the audience his understanding of music and the piano repertoire as a performer, teacher, and a conductor. I learned much about Beethoven’s ‘Pathétique’ Sonata and piano performance in general in the class. Further, I found the Master Class had something to say about personal mastery, listening, and communication, that is, many features we recognize as vital to character, personal development, and leadership, other passionate interests of mine. I describe some of the experience below and reflect about its connection to personal and leadership development, hoping you will make some of your own connections as well. 3) Self C stands apart to listen and judge. If Self B plays what Self A envisioned, the connection is made to Self C.
All these activities of consciousness or selves – holding the conceptualized goal, playing, listening — are going on simultaneously for the performer. And, Mr. Fleisher added, if it all goes well and it sometimes does, one can reach a state of ecstasy. I thought these comments about the tripartite of dimensions of experience illustrated the importance of learning to step back from our own experience to observe, creating a space in time to choose our response, rather than simply reacting to the events, conversations, and activities that surround us – to do this in the midst of action requires an elevated level of personal mastery which demands much practice. Certainly accomplished pianists can conceive of an interpretation of a musical work, then play it with an integration of emotional power and technical prowess that most of us cannot attain while simultaneously assessing whether they are realizing their intentions about the interpretation and make necessary adjustments. Even amateur pianists, such as myself, benefit from a consciousness of all three dimensions of experience in our playing, even though the integration that Tim Jones or Leon Fleisher realize is beyond our capacity. But here I am thinking of the relevance of these capabilities to our maturity and leadership at home and at work. This capacity to observe and move back from an ‘automatic’ response, isn’t this the System II behavior that psychologist Daniel Kahneman, Nobel prize winner in Economics, refers to in Thinking Fast and Slow, that is, developing this capacity to avoid getting pulled in by strong automatic responses driven by unexamined preferences and biases, which do not always serve our purpose or are in alignment with our goals. Sometimes a situation in our lives can trigger a memory, a story that finds a groove in our consciousness to pull us into a thinking or emotive direction (often without our awareness) that may influence us to act in a way that does not serve our purpose. Developing an awareness of this pull or tug is the first step toward being able to pause, acknowledge our immediate response to avoid the undertow as well as appreciate the possible goodness of the response. This awareness makes time and space for broader choices about how to respond. This is a road to mastery that requires practice. An expressive performer responds to music at many different levels and dimensions of experience — intellectually, emotionally, spiritually, psychologically, and physically. The capacity for empathy permits the performer to express deep emotion in interpretation. At the same time, particular pieces of music might awaken strong emotions. In any case, the performer must be both in the emotion and apart from the emotion to successfully perform. It is this capacity to observe while simultaneously being an integral part of the movement that is a vital element of mastery – both for the performer and for personal/leadership mastery. An awareness and the capacity to correct in future time and, with more practice, in the midst of the action itself is difficult to realize. I felt privileged to listen and learn in this Master Class. I was able to savor it a bit more by sharing my reflections above about one part of the experience. If you wish, take the time to listen to one or movements or the ‘Pathétique’ with the link I provided. How does the music impact you? What are your reflections? Sandra M. Martinez, Ph.D., is President of Fenix Leadership & Development, a boutique firm offering organizational and leadership development consulting and executive coaching to businesses and public and non-profit organizations. She melds a strong academic, research background with consulting, facilitation and coaching experience to engage stakeholders at multiple levels of the hierarchy to build trust and build leadership and collaborative capacity to meet strategic goals through customized programs, workshops and coaching.